There may be plenty of pools in Bali, but not all of them were made equal. 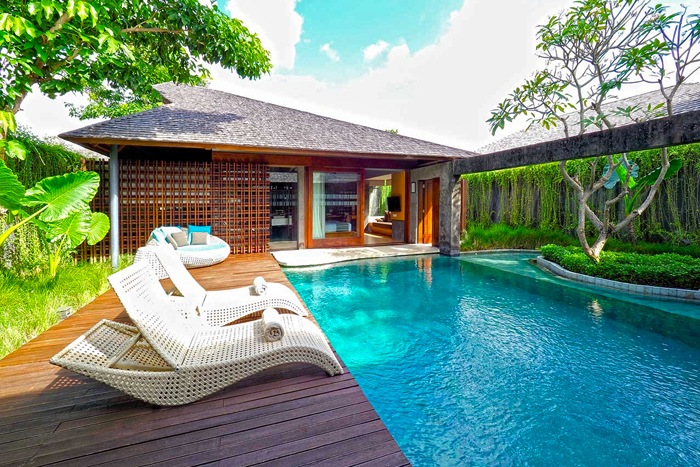 Our selection of the Indonesian paradise's best pool villas represents accommodations for every type of budget and for honeymooners, families, and groups. So if you're looking for something beyond the same ol' guest room, it's time to take the 'plunge'. 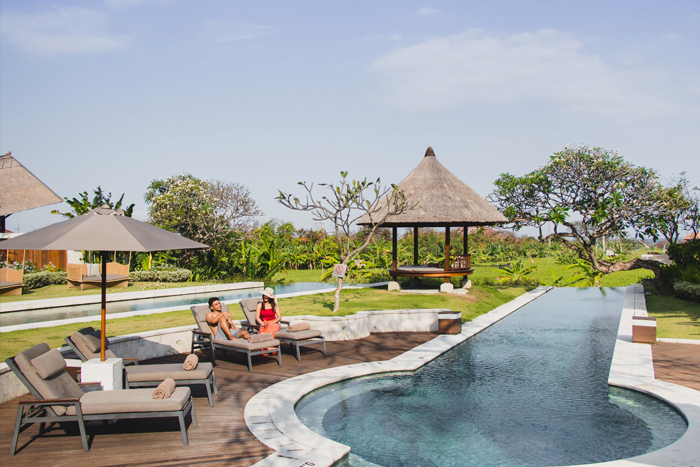 Bali Diamond's aim is to make you feel right at home, whether it's with soft colours, Balinese materials like volcanic stone, or beautifully-maintained gardens with yes, oversized private pools in a local flavour. What's more, this modern hotel is nestled right along the shoreline where some of the island's best surfing spots are located, making it ideal for family vacations and exclusive holidays. Read our review here. 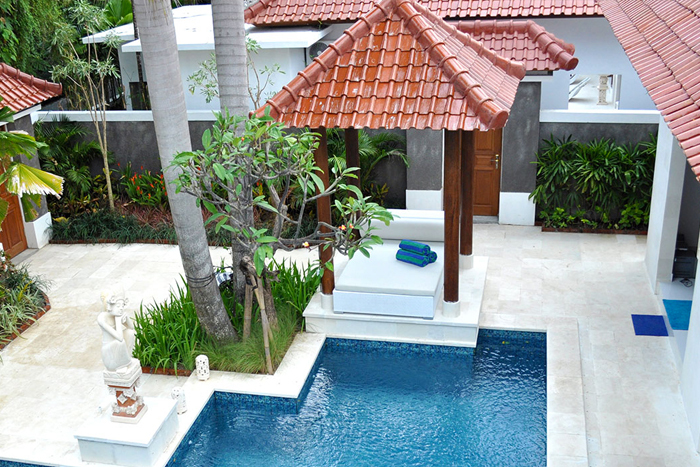 The Samata is Bali's only resort dedicated to health and fitness, and of course that applies to swimming too. And while both their one- and two-bedroom villas feature private pools, the latter has a longer one that's great for doing laps. Get some pampering at the spa, participate in dawn yoga sessions, or work up a sweat on the tennis court, then dine on super healthy dishes at the property's Zenso restaurant. Read our review here. 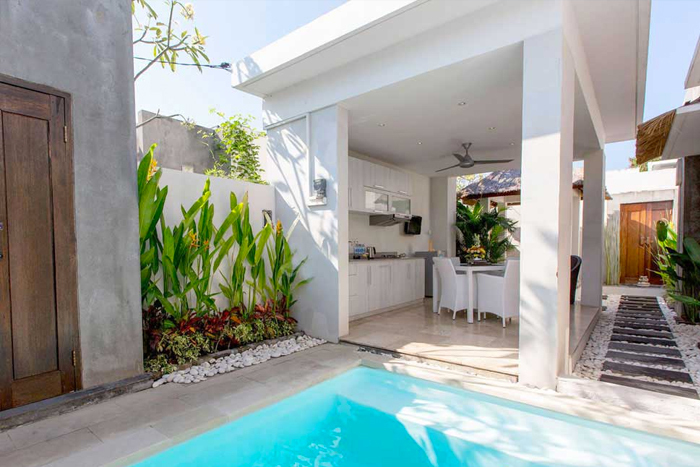 Staying in lively Seminyak doesn't always have to break the wallet, even when it's a zen pool villa with stone sculptures that spew water into your private white stone pool. 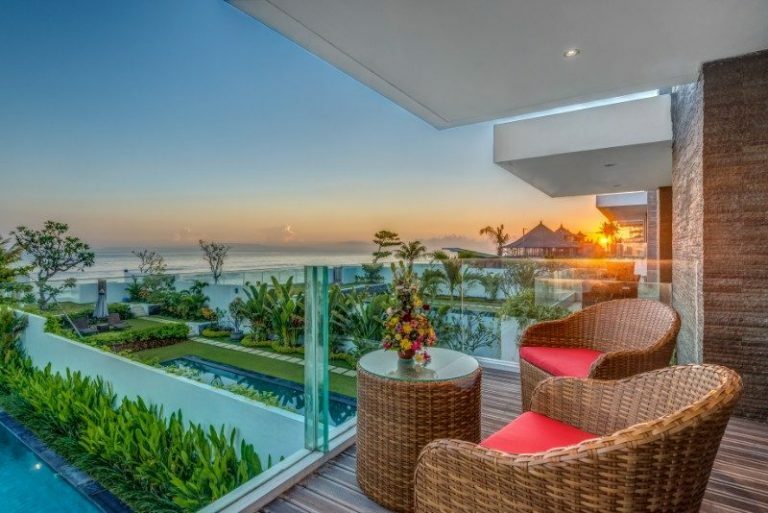 Such is Taman Sari, the tropical resort with contemporary artsy furnishings, homely Indonesian meals and incomparable hospitality from the proprietor Yuda and team, and quick access to the rest of the neighbourhood - sleek bars, beaches, and more. Framed by the majestic Mount Batur in the distance, all of the traditionally-styled villas at this Conde Nast Johansens Award 2016 Winner are designed to let guests indulge in maximum rejuvenation and privacy. Think little luxuries like a private plunge pool filled with natural spring water (the leaf-shaped one in the Royal Pool Villa is especially gorgeous) and idyllic in-villa gazebos for massages and exercise. 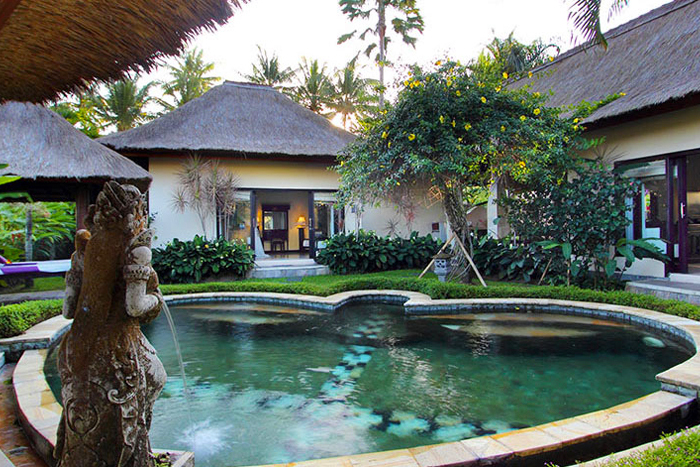 As far as under-the-radar hotels in Bali are concerned, Villa Sarchi is one of the best. This glorious clifftop hotel in the tranquil area of Amed isn't the easiest to reach, but when you do, you will enjoy your own outdoor swimming pool that overlooks the sparkling ocean. Enjoy your mornings on the spacious patio while sipping local coffee before a hiking or snorkelling adventures nearby. This is the part of Bali you never knew about. Kayumanis is an intimate hideaway in the heart of mystical Ubud, taking you away from the chaos of crowds into a fragrant haven of cinnamon tree groves and colourful blooms. It's also snugly tucked next to the Ayung River, which you can observe from most of the 23 themed villas here. 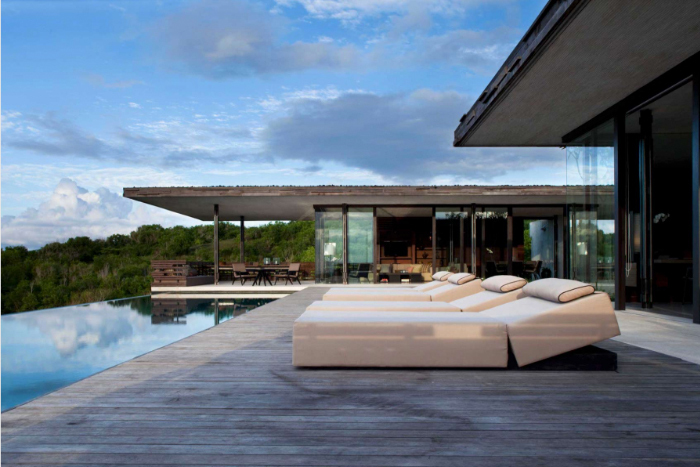 Furthermore, each comes with its own sizeable garden, swimming pool, as well as an open air living pavilion. Just note that Kayumanis does not accommodate children under the age of 12. If you've always dreamed of having a pool in the middle of your house, this is it. 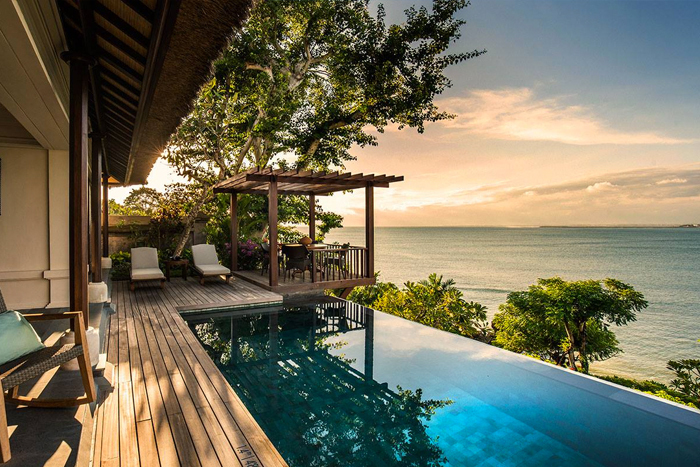 The Santai has over 10 villas offering a peaceful Balinese experience, accentuated with highly personalised hospitality and well, an unusually large 10-metre long pool that starts between your bedrooms. Jump on the inflatable pool floats for your Instagram moment, take a cooking class to learn about the local cuisine, or enjoy a massage on your sun deck. Read our review here. Sitting in the calm Jimbaran Bay with three miles of sand, this all-villa resort channels a Balinese village vibe and boasts everything you love about the Four Seasons brand. Inside your thatched roof villa hides oversized indoor and outdoor living areas, along with a personal courtyard and infinity private pool that's surrounded by flowering frangipani trees. As for the views that gaze out into the Indian Ocean, it's rather unforgettable. Remember OMNIA, the groundbreaking day club we featured last year? Conveniently situated next door is the jaw-dropping gorgeous Alila Villas Uluwatu, an eco-friendly contemporary hotel that checks all the right boxes: soothing Balinese-inspired design, unparalleled sea views (it's perched at the edge of a limestone cliff) and private pools with cabanas. Thanks to its impeccable 24-hour butler service, a dreamy honeymoon is not simply a dream anymore.